Ever since accepting a bet to solve South Australia’s power woes, Elon Musk and his company, Tesla, have rarely been out of the news. 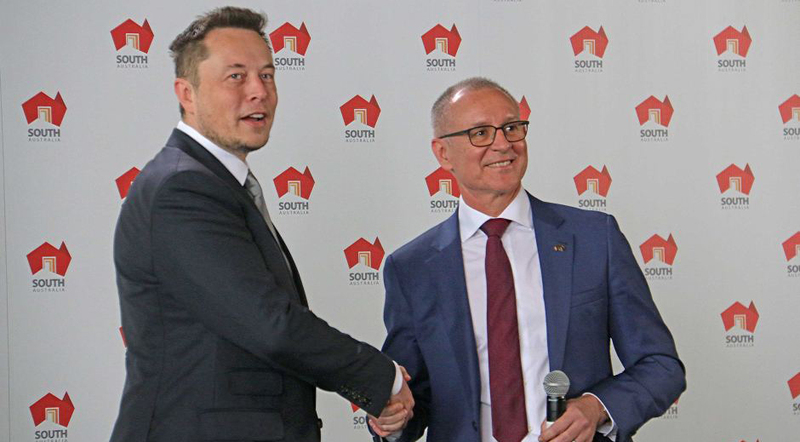 Tesla’s recent announcement with the SA government shows the state’s PM Jay Weatherill is just as fond of a wager, as he bets a partnership with Mr Musk will secure victory in the upcoming state election. The deal could see Tesla provide 50,000 batteries and solar systems to SA households under the proviso that the power produced would be owned by a retailer. This would create the world’s largest virtual power plant with capacity of 250MW. The scheme has its merits, with the potential to provide much-needed clean energy, but it also represents another PR coup for Mr Musk. Given Tesla produces batteries that complement solar panels and Australia has one of the highest rates of household solar penetration of any country in the world, it is perhaps unsurprising Mr Musk doesn’t mind a bit of publicity Down Under. And it has worked. The Tesla brand is now synonymous with battery storage. Arguably the adulation is deserved as Tesla’s headline grabbing antics have put batteries on the national stage. Meanwhile, its 100MW battery in SA, installed in under 100 days, has been switched on numerous times over the summer to balance the grid and protect against blackouts, demonstrating the role large scale batteries can play in the energy system. While Tesla’s rise to national prominence may have started out as a social media flutter, the company’s competitors must now consider similarly grandiose plans to build brand awareness and market share.